Pick up from your hotel after the breakfast and the depart from your Nairobi after breakfast for a journey along the floor of the Great Rift Valley with a stop over at the View Point to have a glance at the Breathe taking Escarpment with Panoramic View of Mt. Longonot. Lunch enroute, and then enter Maasai Mara in the afternoon to enjoy a game drive before proceeding to the campsite for dinner and overnight stay. Full day will be spent in the vast Maasai Mara in search of its renowned plain game; Black manned Lion, Leopard, Cheetah, and migration of Wild Beast and Zebras. The ride will take you to the famous Mara River where we have the Hippos and Crocodiles. This section also boasts of many species of Bird life. Dinner and overnight at the campsite. After breakfast leave Maasai Mara for Lake Nakuru National Park. Lunch enroute. On arrival proceed for a game drive round Lake Nakuru to view Flamingoes, water buck, buffaloes etc. Lake Nakuru is a bird watchers paradise and over three hundred species of avifauna can be sighted. After bird and game viewing continue to Lake Nakuru Guest House for dinner and overnight stay. 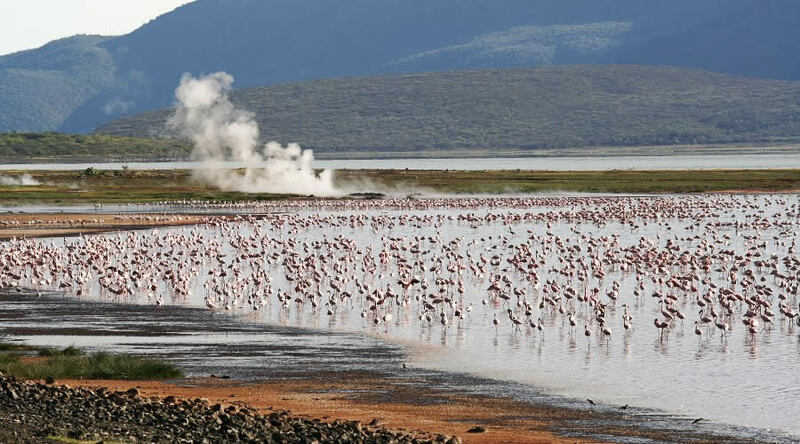 After the breakfast leave for lake Bagoria,this is a highly concentrated lake with flamingoes and you will be able to see the hot springs.After exploring this lake you will drive back to Nakuru for dinner and overnight in the camp or hotel. After breakfast leave for Nairobi, stopping at the Great Rift Valley for a panoramic view, and continue to Amboseli. Lunch enroute .16 hours: Proceed for a game drive in search of cheetah, rhinos, elephants, and also plenty of plains game, with the Majestic Mount Kilimanjaro in the back ground.Dinner and overnight at a budget Campsite. Proceed for a game drive after breakfast. Lunch at the Campsite. After lunch, a further game drive in search of the Jumbo (Red Big Elephant).Dinner and overnight at a budget Campsite. After breakfast go for the last game drive as you check out the camp and head back to Nairobi with a drop of to the hotel or to the airport to catch up with the flight back home.